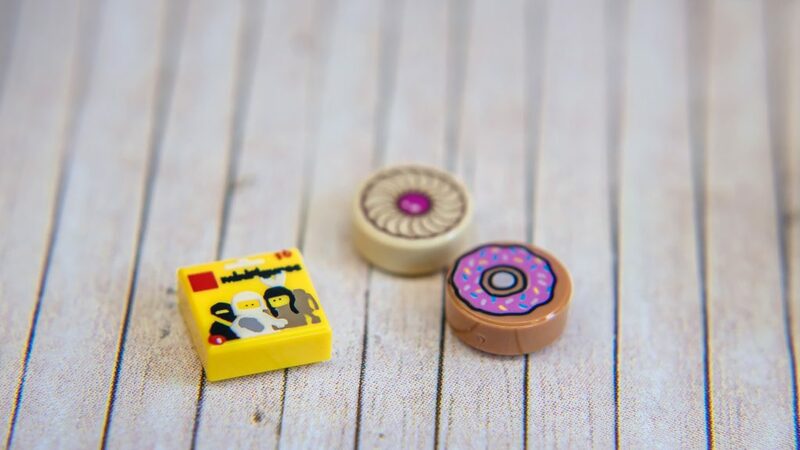 The Series 18 Collectible Minifigures celebrates the 40th Anniversary of the LEGO Minifigure. And what better way to celebrate than a costume party? 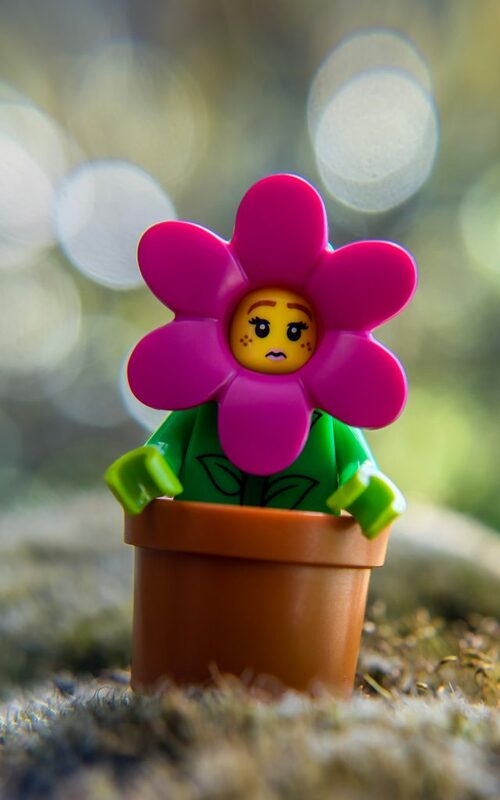 With her pretty pink flower headpiece sitting atop the stem that is printed on her torso, the Flowerpot Girl is a horticultural delight. If I looked as lovely as she does, I’d smile too. Although all that time growing in the sun has given her freckles. Should flowers wear sunscreen? Maybe that question is why her other head print looks a little concerned? 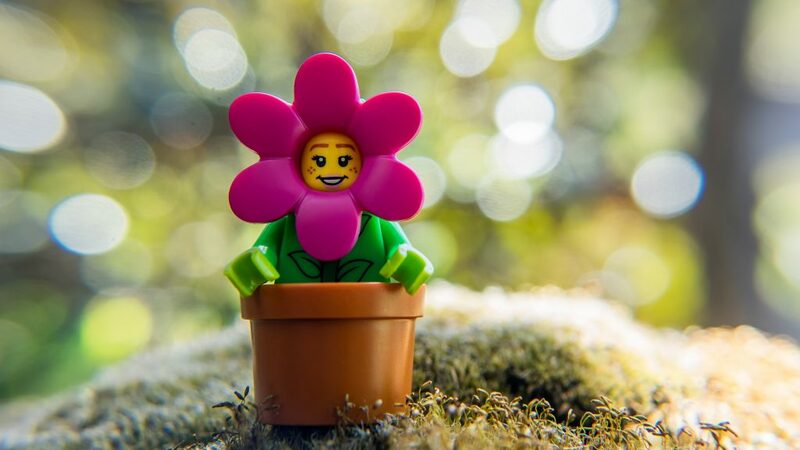 The Minifigure sized terracotta coloured flowerpot is great new addition. 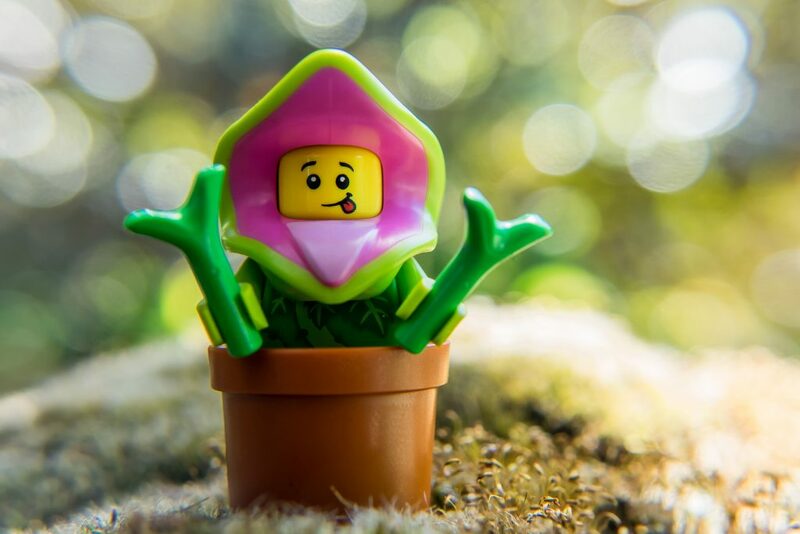 I can’t wait to plant some Series 14 Plant Monsters and see it they grow! How cool are fireworks? They’re wear your sunglasses at night cool! 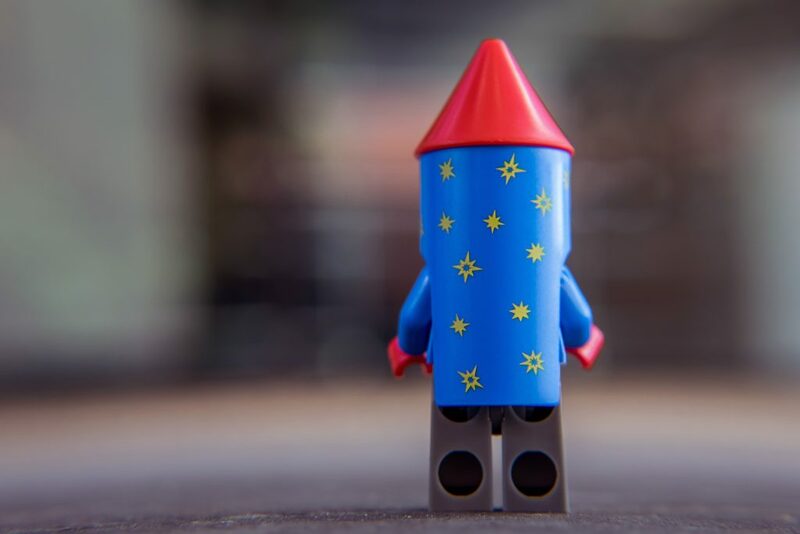 The fireworks rocket is a clever twist on the Series 17 Rocket Boy. 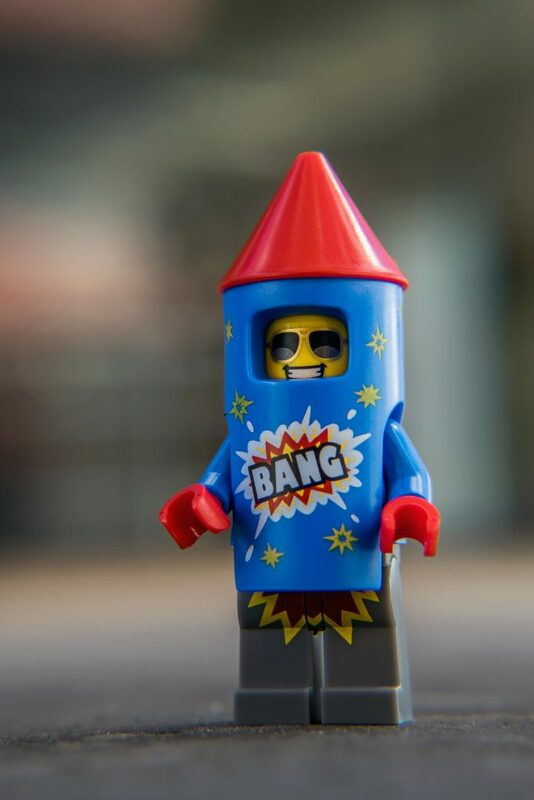 The print on the fireworks rocket instantly took me back to the days that fireworks could be bought in the local shops here. There’s a lovely 1980’s style to the graphics. The fireworks’ flaming fuse appears dangerously close to this guy’s crotch. Yet he still smiles? Or maybe it’s more of a grimace? The elephant headpiece is gorgeous and sits atop a simply printed torso and legs, and a double-sided head, one smiling and the other squealing, presumably at the mouse. 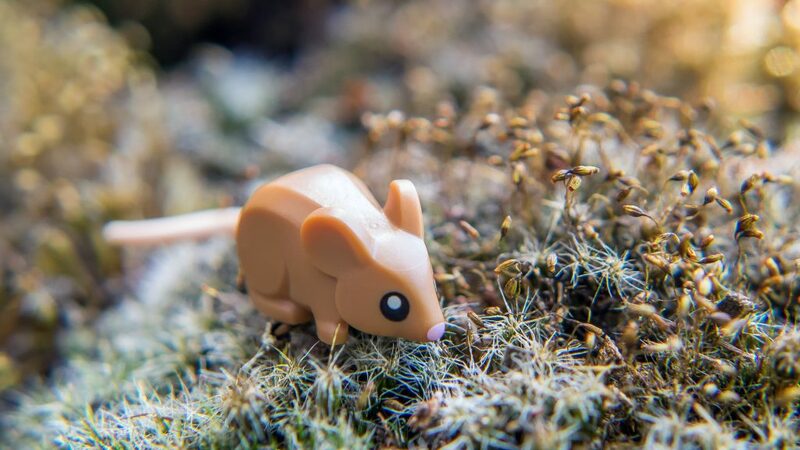 And if she’s like me, it’s a squeal of joy for the new LEGO mouse. 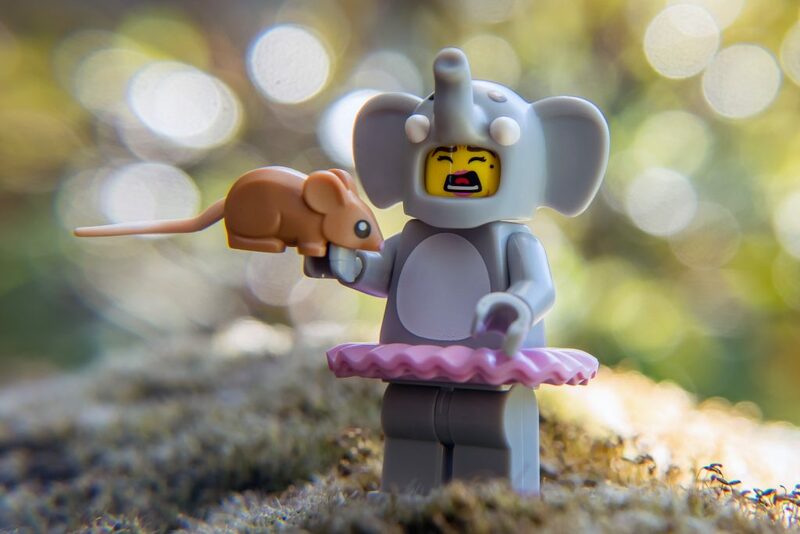 I’ve always been frustrated with LEGO mice. But this one quashes any frustrations I’ve had in the past. His wings are from the Series 16 Imp. The tail is an adaptation of the Series 5 Lizard Man’s, with an added dragon point on the end. His double-sided head goes from smiling to anger in just a180° twist. The real highlight is the headpiece and the torso printing. The headpiece is sure to be utilised beyond this character in photographs. Black scale prints adorn the upper arms and the torso, surrounding the orange printed reptilian underbelly. Giddy up! His cow print vest reminds me of Woody’s from Toy Story, which is a fitting style for this Series. A more detailed cowboy torso like the Series 6 Bandit would’ve been too much for such a celebratory reflective Series. 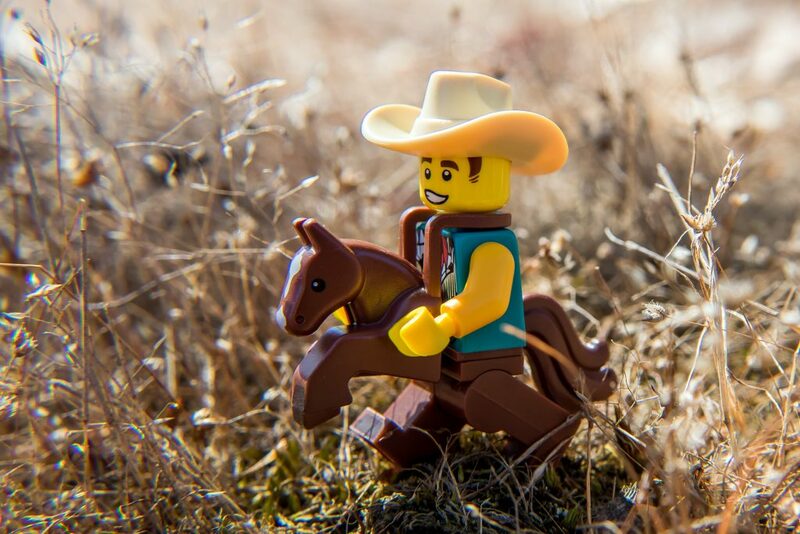 The sideburns are subtle nod to some of the earlier Minifigure head prints with their stylised lined sideburns, like Johnny Thunder from the Adventurers sets. 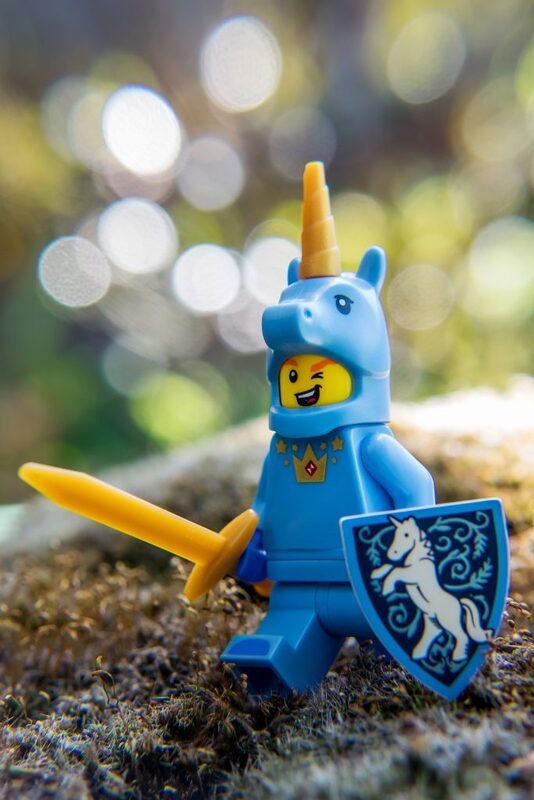 The horse costume is a really clever addition that pays homage to the LEGO horse (10352c01pb01) with its white forehead and muzzle markings and a reminiscent pose of the legs. Some people are cat people. Some people are dog people. I’m a dog person, but the Cat Costume Girl might just sway me. The new head mould is great. It really gives the impression of a costume rather than just that of a cat. Maybe that’s because it doesn’t completely cover the head? Under her feline mask is a wonderfully “painted” face. She has a “Flying Monkey/Scratchy/Cheetah” style tail, this time in black, a black coat with white “socked” arms and legs, and a grey studded collar with a paw printed tag. 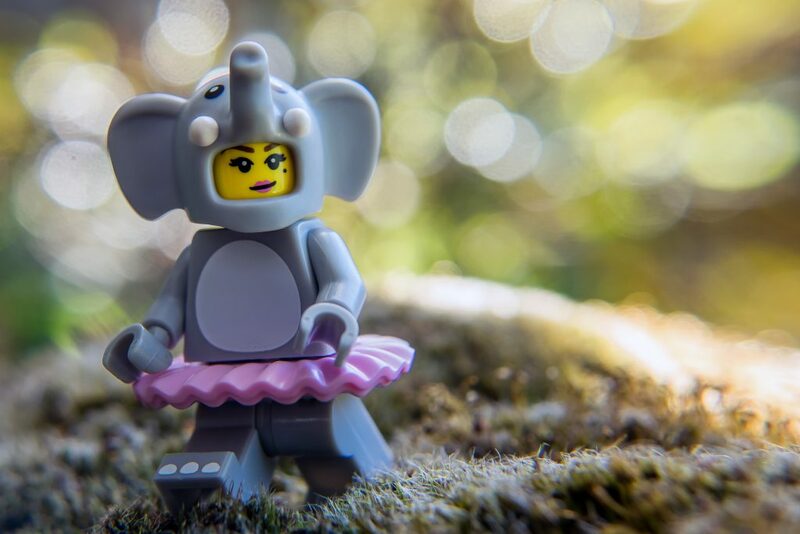 I bet she has her eye on the Elephant Suit Girl’s mouse. Well, maybe after she’s finished her fish supper. 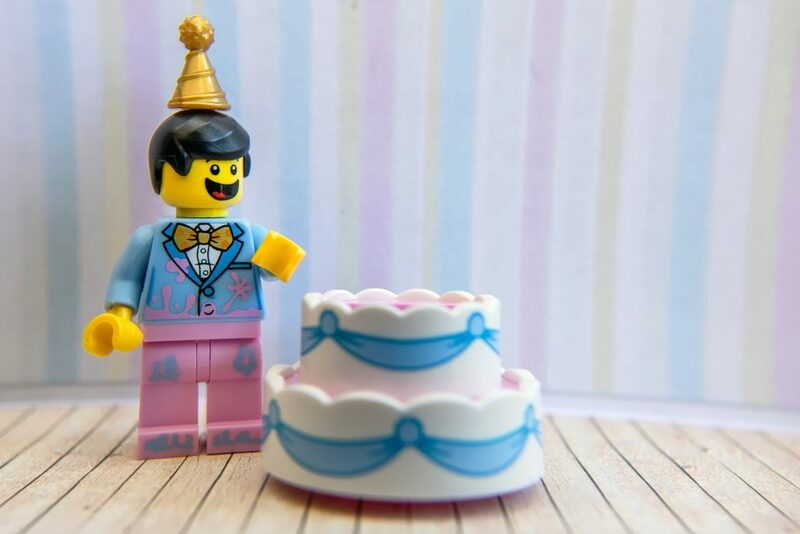 A baby blue suit jacket splattered with pink cake frosting and a Minifigure head images emblazoned bowtie.This guy is a new twist on the Minifigures that we’re used to…he stands inside the cake, not through it like we’re used to. The cake is a great piece that will no doubt get a lot of use on its own. 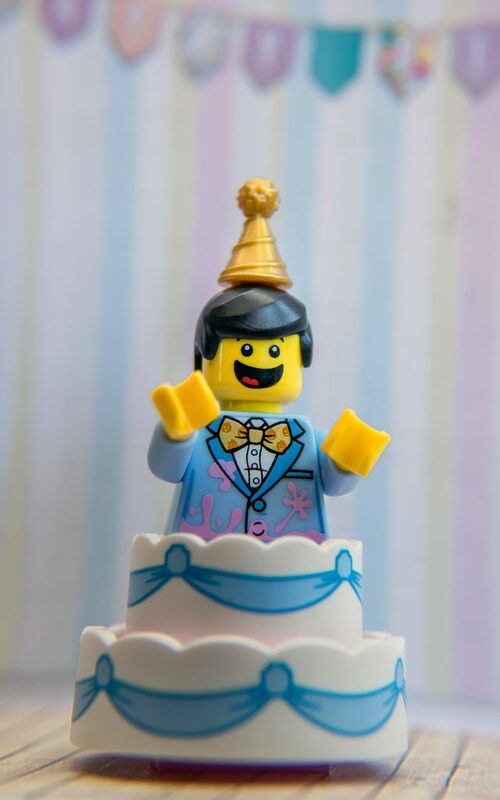 A gold part hat sit atop his modernised standard hair, a nice twist on the original Minifigure hair, and another clever nod to the source of celebrations for this Series. Simple yet stunning! 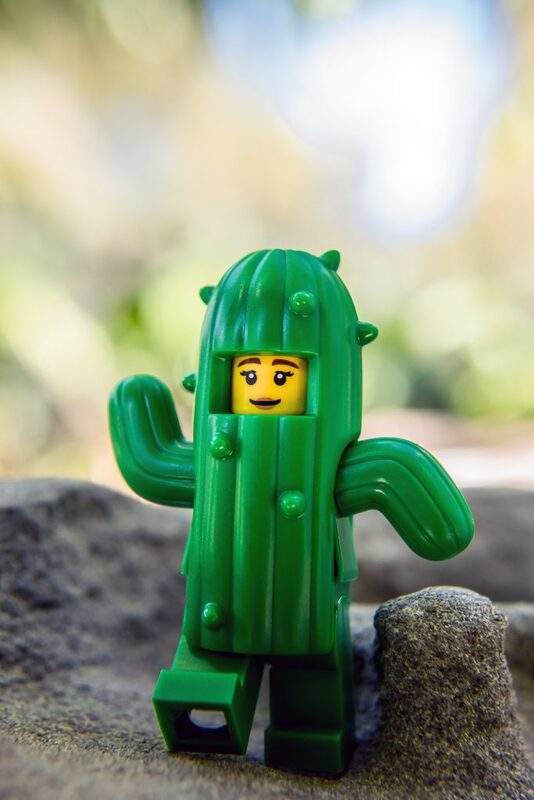 When I first saw images of the Cactus Girl, I thought she was a little lacking in details. But I was wrong. 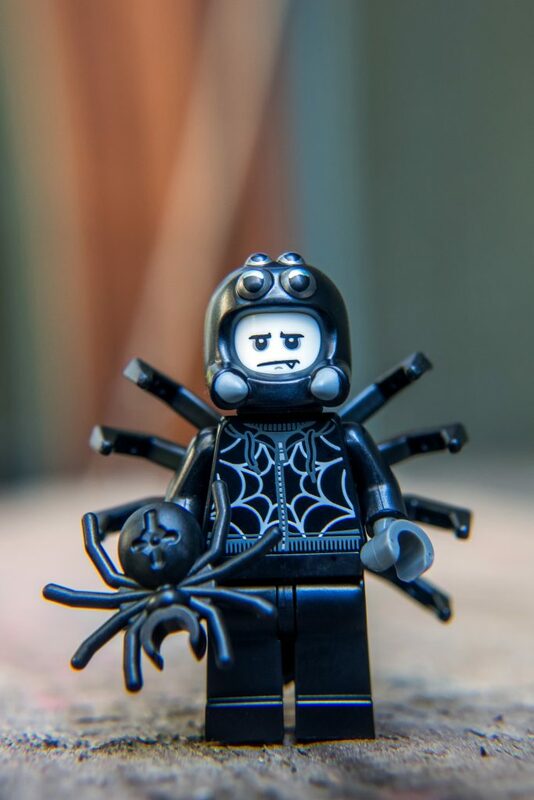 Too much added “costume” details would’ve made this Minifigure destined to only be a costume. By keeping her and her costume simple, she can be used for so much more. 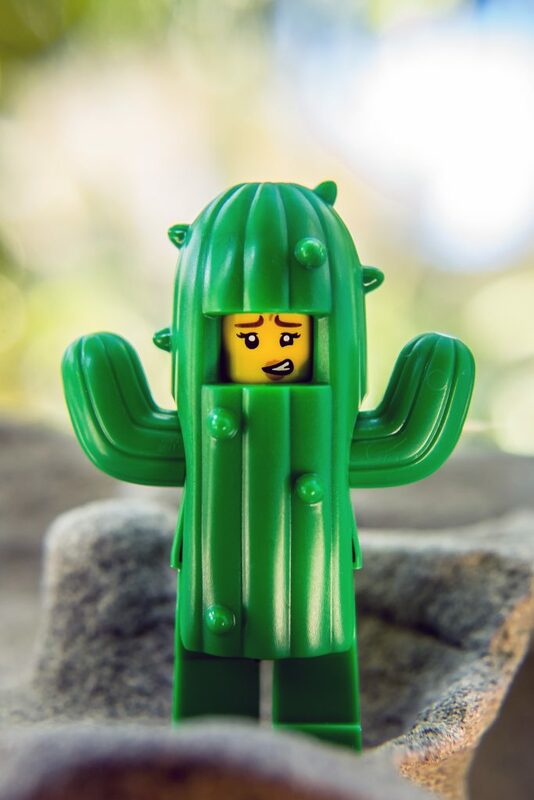 It’s hot work being a cactus! The two head prints are great especially the one looking concerned with all the days spent standing in the desert. Party Boy and Party Girl might not be in costume for the party, but boy have they donned their finest party attire. 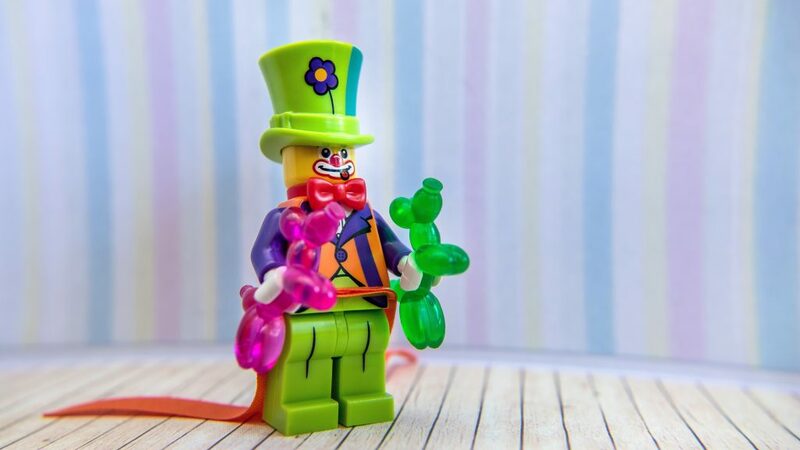 The Party Boy’s Minifigure head printed short sleeved shirt is complimented by and striped tie. Party Girl’s singlet is accented by a pink bow, and her pigtailed hair sits under a purple party hat. 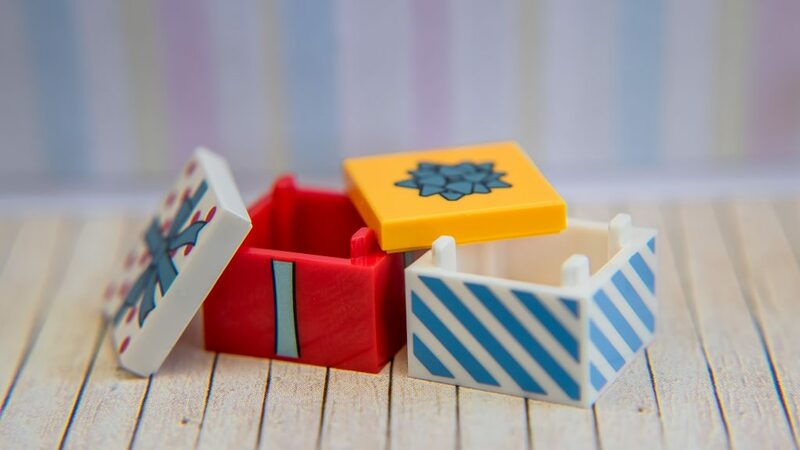 Both of them come bearing gifts with 2×2 crates printed on all four sides and a 2×2 printed tile on top. They both have balloons (weird sacks of breath *see below) that are wonderful new moulds with so many opportunities for creativity awaiting them. Party Boy has a printed 1×1 tile. The Series 1 Minifigure bag with the Ninja, Spaceman and Tribal Hunter is printed on it. 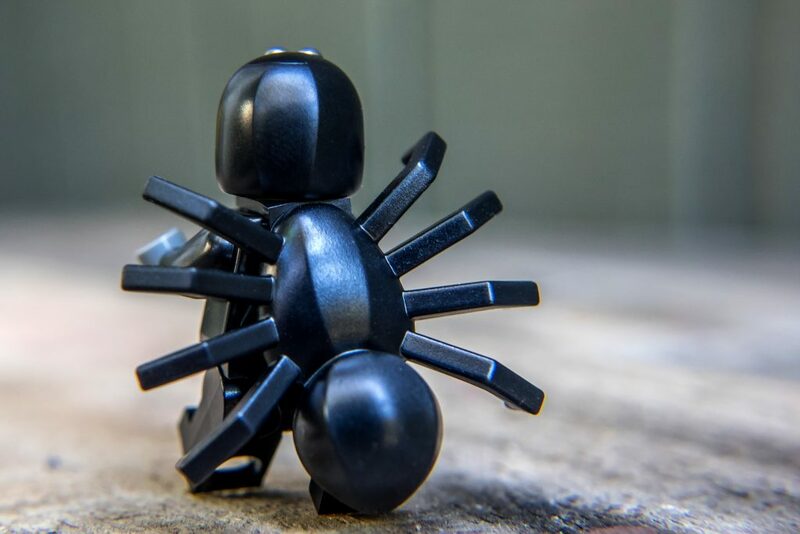 A clever nod to the Minifigures that this series is celebrating. Party Girl comes with party treats. Finally the Series 13 Unicorn Girl has a friend. And what a friend! With his confident winking, smiling face sitting under his golden horned blue unicorn head, he’s bound to look after his Series 13 friend. His torso is printed with a golden crown and stars motif. He also comes with a unicorn emblazoned shield and golden sword. 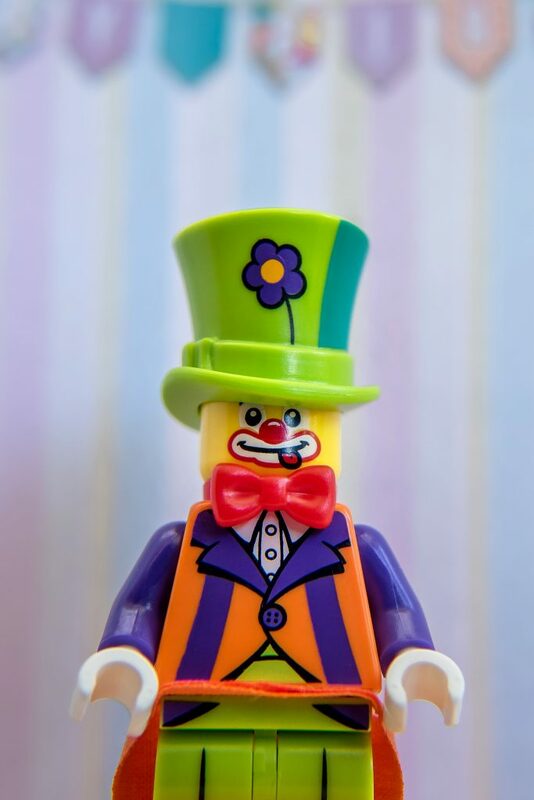 I love the expression on this Minifigure’s face. It almost look as if he’s feeling a little squeamish holding that spider, and that he’s in a spider costume! 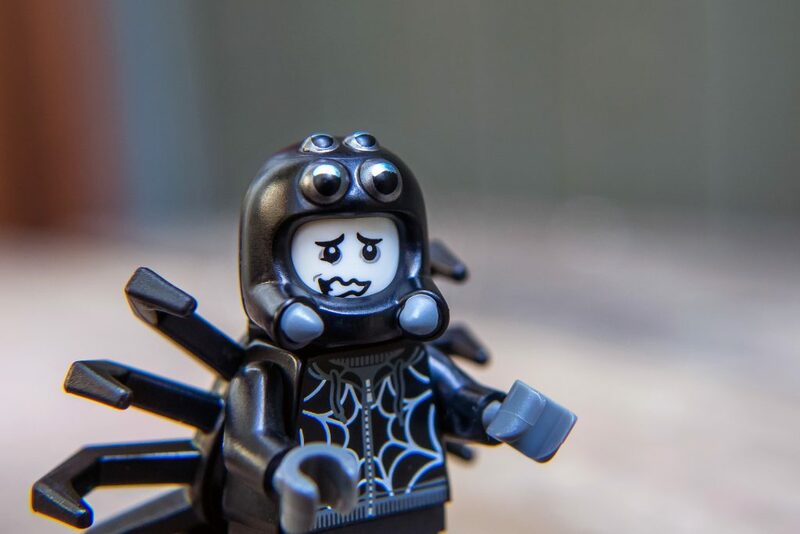 And then there’s the “meh” spider expression. I imagine all spiders look like this. The headpiece is wonderful. And the eight-legged back piece is super ace. 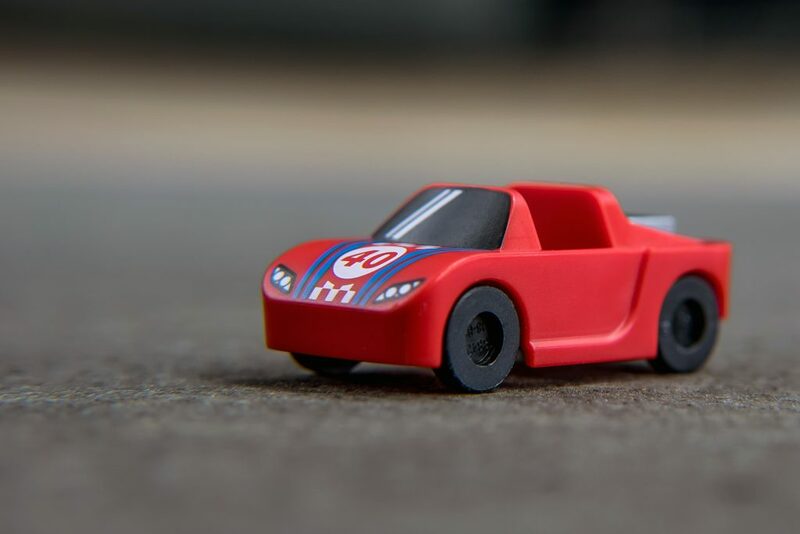 What a coincidence that the Race Car Guy’s race car is number 40. That’s the same number as the Minifigure anniversary! 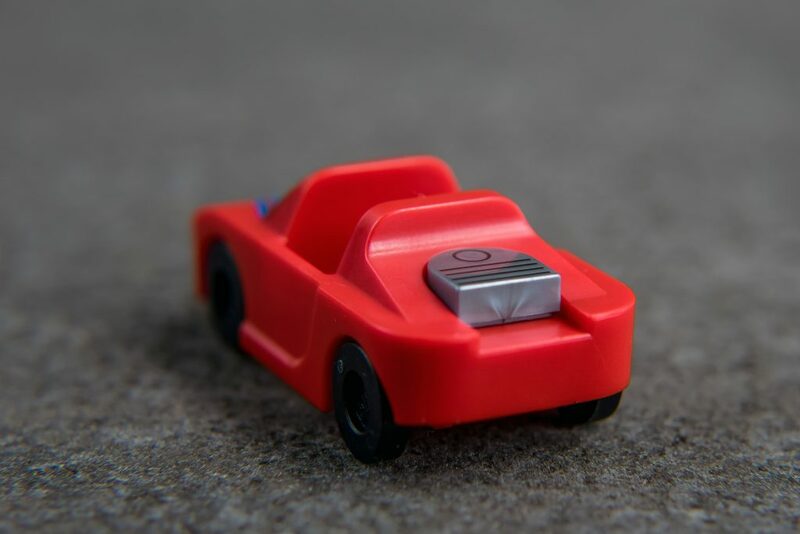 But you probably won’t notice that, because this guy’s probably whizzing past you too fast. The racing jumpsuit and helmet and wonderfully printed with checkered designs, “clutch drive”, “grand prix” and “cross axle” sponsors logos. The car costume is a great accessory too. I can’t wait to see the brilliant photos that will undoubtedly be created using the car costume without the driver. Classic, in every sense of the word. With only one in every box, I’m sure he’ll be in high demand. But it shouldn’t be based on his rarity. It should be because he’s a brilliant remake of 1978 Police Officer. 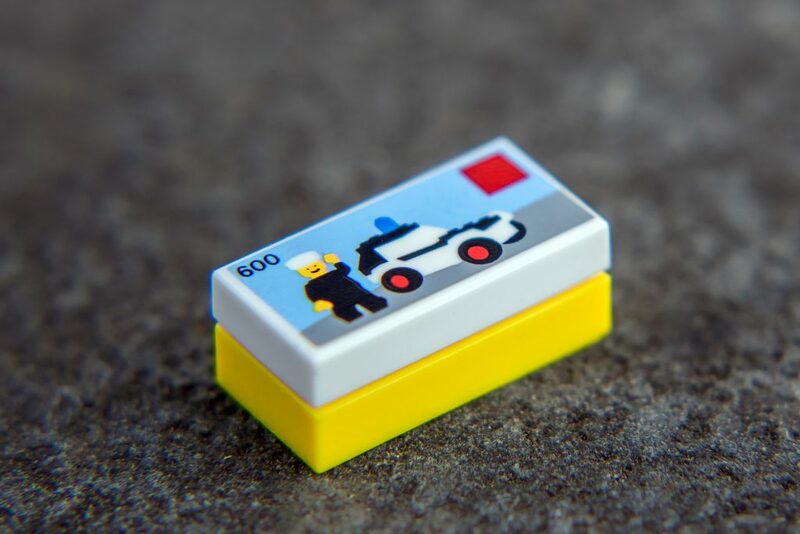 The printed tile represents the 600 Police Car is a Town themed set released in 1978. This set contains 21 pieces, building a Police Car and a Police Officer. A stroke of nostalgic genius! It’s no secret that I have a fear of clowns. And I think balloons are weird. But this Party clown with his sacks of breath are fantastic! His red bow tie, orange Joker- esque coattails, orange and purple jacket and oversized top hat with purple flower print are great. The purple and green trans balloon poodles are so good. Again, I can’t wait to see these appear in photos! I was super keen to check out these two costumes. Could they interlock like regular non-costume LEGO Bricks? 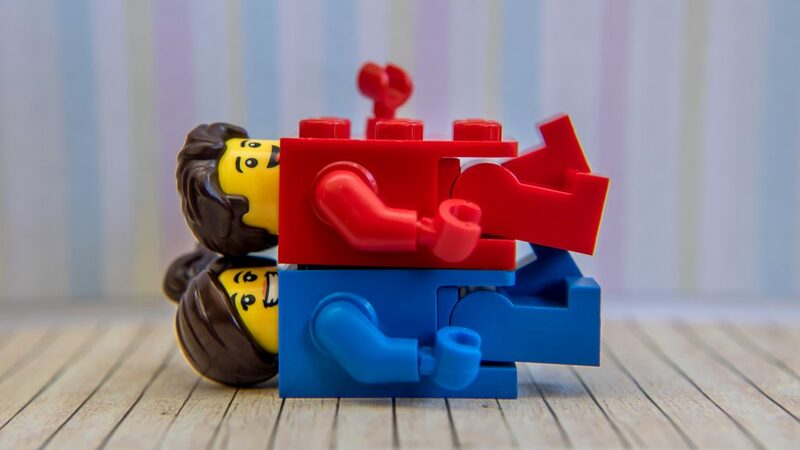 Would LEGO allow them to interlock, or could that be misinterpreted as a bit rude? 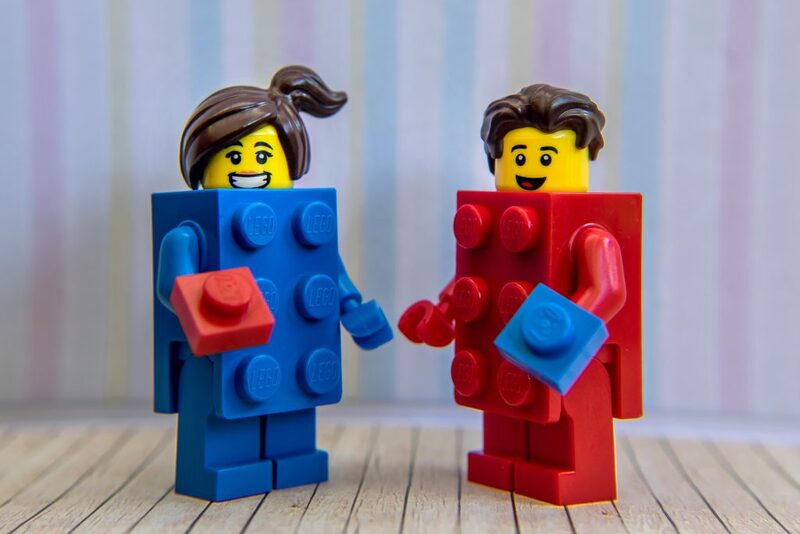 Well, the LEGO Brick costumes can interlock. So that answers those questions. The head prints on these two are great! And the brick is actually the torso, so that answers my question of how the head fits so snugly too! I can’t remember a stronger assembly of Minifigures than Series 18! This is one costume party that I’d happily attend, but undoubtedly leave without a “best costume” award. Gee, imagine having the arduous task of picking a best dressed winner. Can the prize be split 17 ways? The Series 18 Collectible Minifigures are due to hit the shelves April 1st. Thanks to our friends at LEGO for giving us the opportunity to review this series. 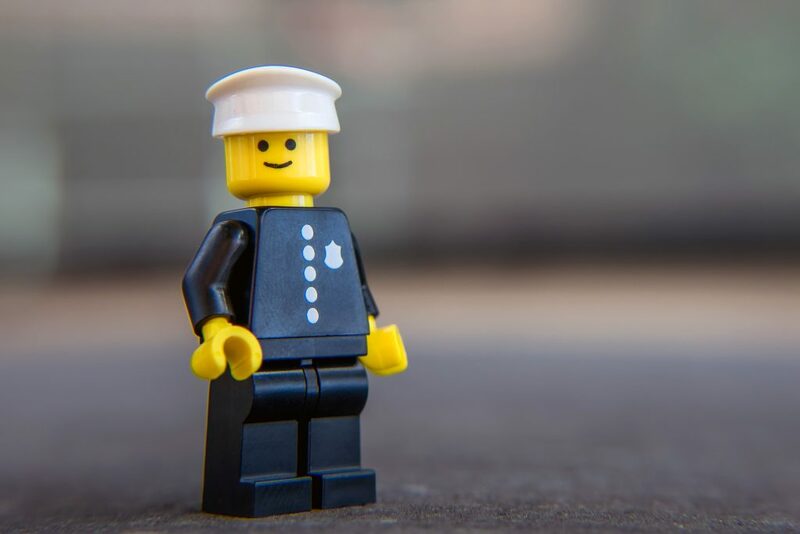 As with all our LEGO CMF reviews, we’ll be giving away a complete set of Series 18 Minifigures, including the one and only Police Officer! As a thank you to you for reading this review, you get a head start on those who haven’t. 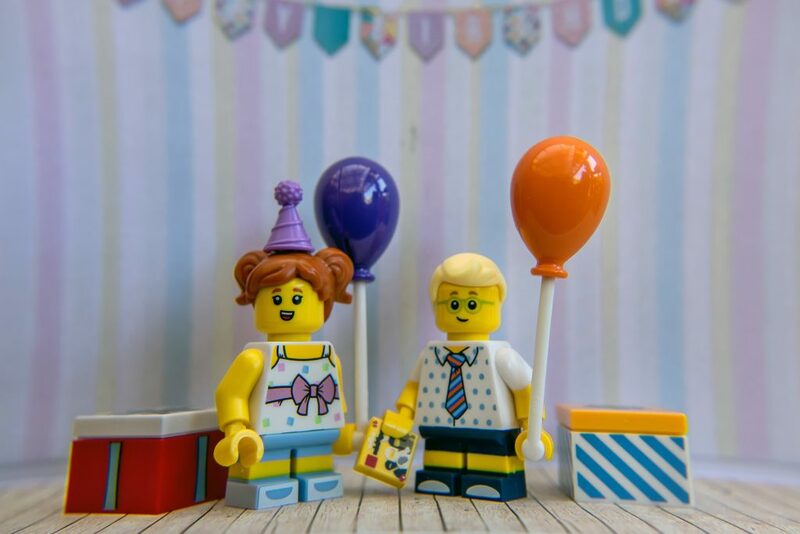 We’ll be asking for “party” themed photos, celebrating the LEGO Minifigure to posted on G+ and Instagram using the #toy_photographers and #toy_photographers_series18 tags. We’ll announce the giveaway in the next week, but you have a head start, just for reading our review! You can enter as many times as you want. 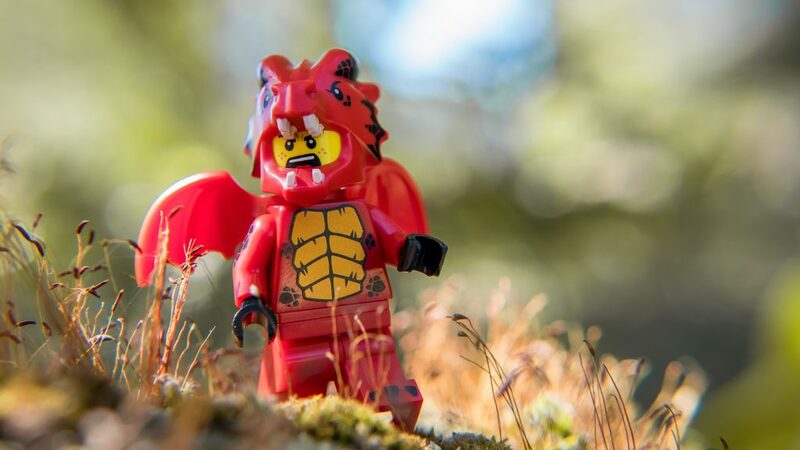 We’ll be calling on our past CMF giveaway winners to help us judge the best and most creative photos. Good luck! 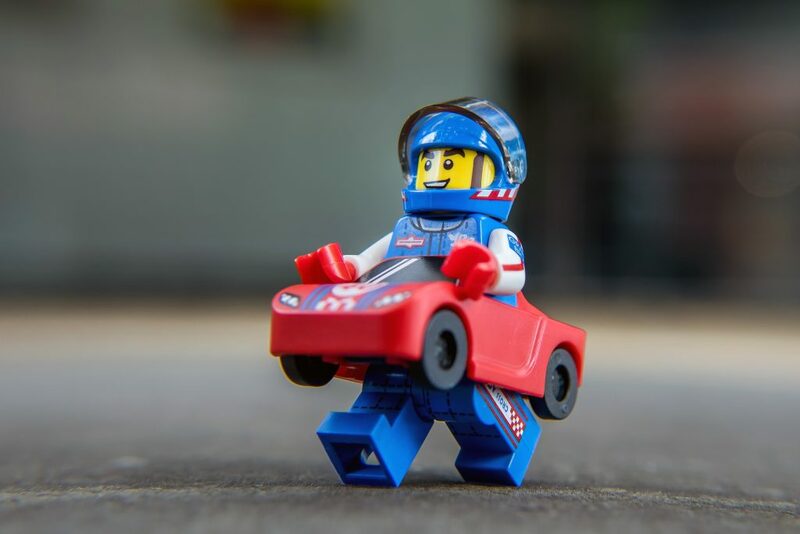 Do you have a favourite Minifigure from Series 18? If you’ve made through all my blathering and ended up here, you should sign up to our weekly email round up where you’ll get a recap of all the babbling from the week plus exclusive new content. I love them all but the party clown is my favorit. Party Clown is amazing! 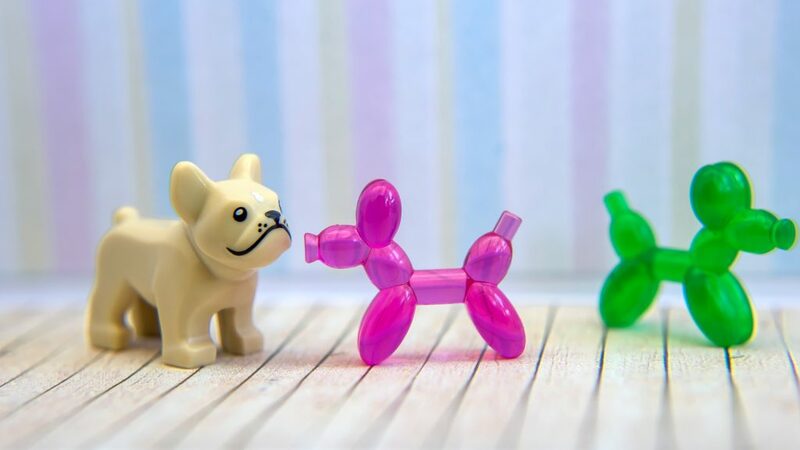 Those balloon poodles are so cool! This entire series is wonderful! And yes, the Cowboy Costume Guy is galloping towards one of my favourites! 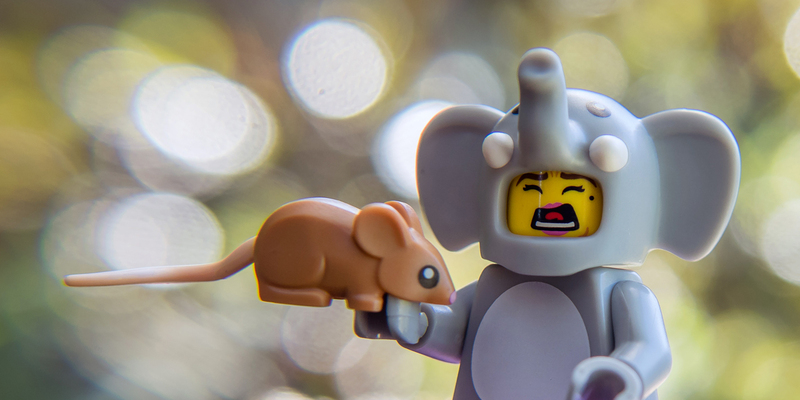 I definitely want the elephant because the mouse is so cute and will end up in the background of future shoots. Cactus girl to make a cactuar final fantasy shoot. In truth, I want them all! They’re adorable. The mouse is one of my favourite accessories in this series. I’ve wanted a good mouse for so long, and now it’s here. And it’s wonderful! Yes, they are all adorable!! Every single one is wonderful! It is definitely a ‘need them all’ series. Well the unicorn boy is one I was excited for but now I’m even more excited for the dragon and the Elephant girl!!! I hope I can win a full set, otherwise its going to be a dent in my wallet. I wasn’t excited about the Red Dragon Suit Guy when I first saw images of him online, but he’s one of my faves now that I’ve shot him. He’s so good to photograph! Good luck in the giveaway!! Great review Brett! You’re right when you say it is one of the most appealing series to be released in a while. I ‘need’ the dragon (and every other one of these figures). Of course I’m bracing for the inevitable ladies popping our of the cake photos. 🙁 But those balloon animals totally make up for that. Agh!! I cant wait!! Thanks Shelly. I hadn’t thought of that use for the cake? But then again, I haven’t had much time tom think, rushing to get the review done as quickly as I could! The balloon poodles are stellar! I’m looking forward to exploring their possibilities. Fantastic review and pics Brett. Really lovely job — who knew a review could be so engaging and amusing? I’m in love with the unicorn and the dragon, but I’m sure I’ll fall for some of the others, too. Thanks so much for posting and for announcing the fun competition. This set seems a bit more ripe for naughtiness than some, or perhaps that just me. In any case, thanks again. Hope you’re well. Thank you Doug. The Red Dragon Suit Guy is quickly becoming one of my faves too. But ask me again tomorrow and I’m sure there’ll be a new contender. This series is so good it’s impossible to pick a fave! Good luck with the giveaway. Make the most of your head start! Cheers. So much to love about this series. Agree that it’s probably the strongest CMF set so far. Lovely photos and review as always, Brett. Can’t wait to get my hands on these! Thanks Arvin. It’s without a doubt my favourite series! 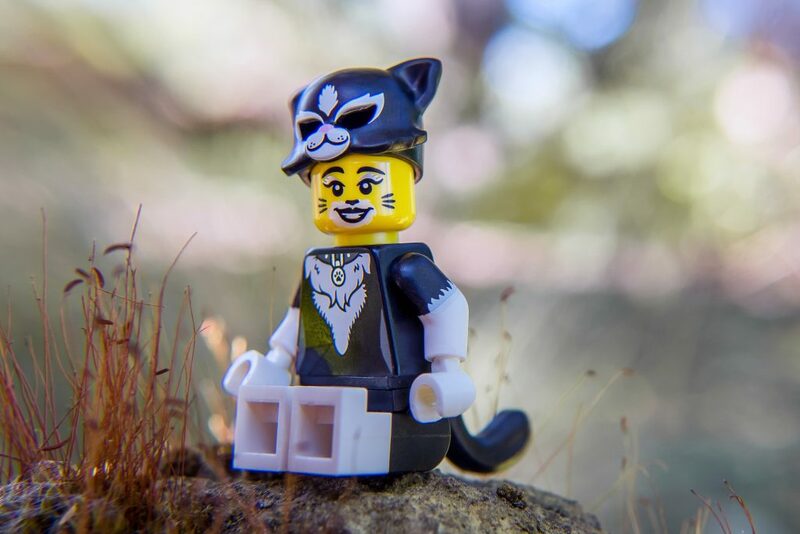 Every Minifigure is top notch, and so many fantastic accessories. The balloon poodles are amazing. And the 600 Police Car and Series 1 printed tiles are super cool. Great review Brett! 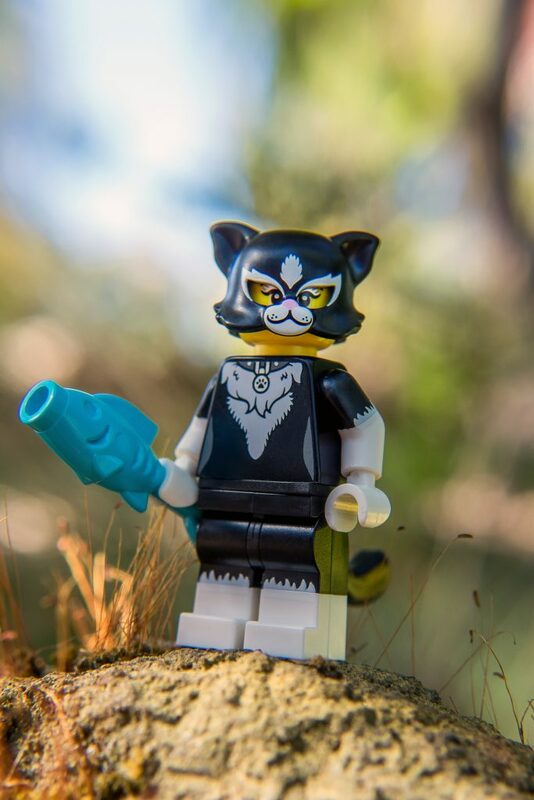 Those minifigures look so cool! I can’t wait to get some. I think I have too much costume for my character but who cares? It’s so awesome! Thank you! It really is a fantastic series. I’m sure your “some” will turn into “all”! I’m excited to see them all, but the dragon suit guy is really exciting. They are all amazing. 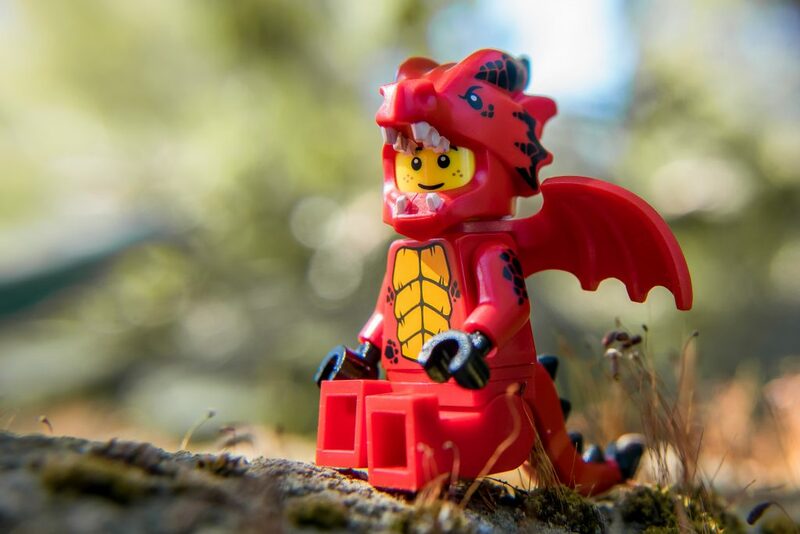 I was least excited about the Red Dragon Suit Guy, but after shooting him, he’s one of my favourites now. He’s so much fun to photograph! I too thought I’d picked my favourites before the box arrived, but that soon changed. This series is going to be one of those that every time I’m asked, my answer will be different. I look forward to seeing your photos with this amazing series! So anyone can enter the giveaway?